If we hit 100% funded today, I will add an extra adventure encounter on the Road, which features these hairy heathens, called Hunter’s Moon (which is what October’s Full Moon is called over here in the UK, and comes from Anglo Saxon calendar when it was a time to slaughter and butcher livestock before winter). If you haven’t backed yet and are following these updates, you’ve got an even simpler job of backing the campaign today, and if we fund today, I’ll give you the opportunity to name a werewolf. Here’s a quick update on the Road to Hell Kickstarter, which closes on Tuesday 30th October, which at the time of writing stands at 79% funded. Jon Hodgson has completed this amazing cover. 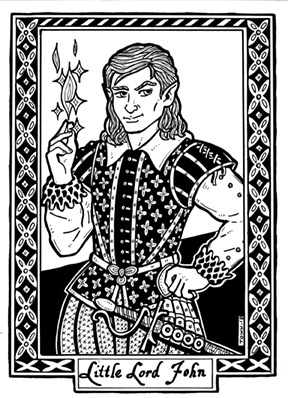 Peter Town also provided another portrait for one of the pre-made characters, the Elf Little Lord John. 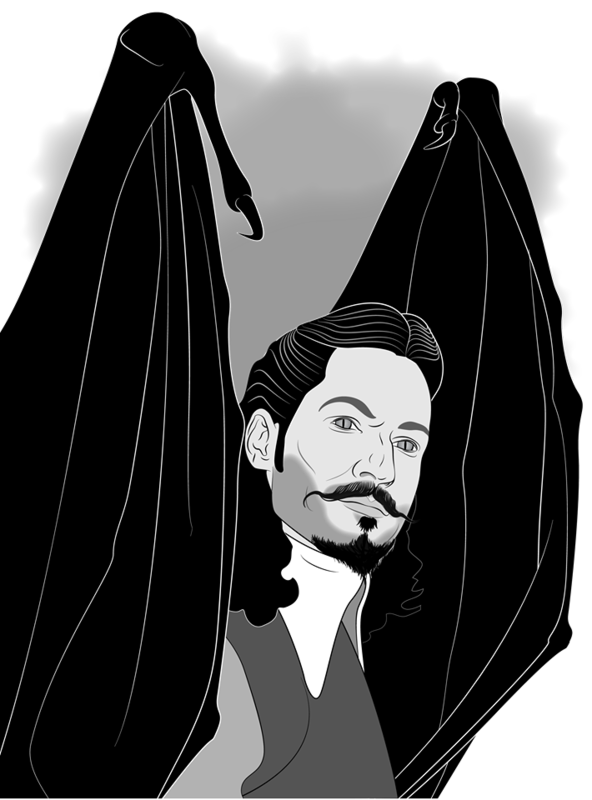 And Daniel Barker has come up with a picture of the Great Adversary himself! Road to Hell Front Cover Now Complete! 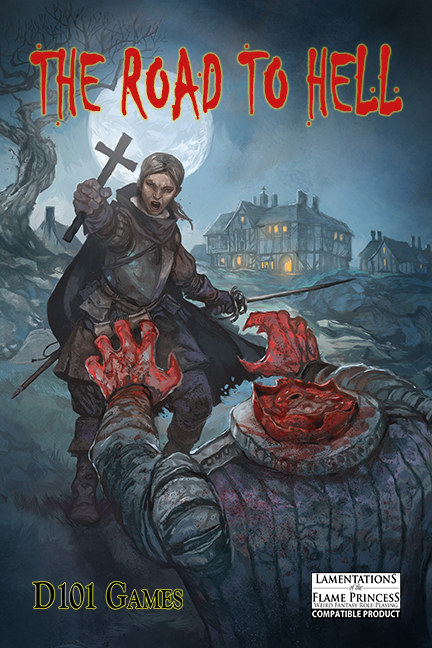 Jon Hodgson has nailed it and provided the final full-colour cover for The Road To Hell. 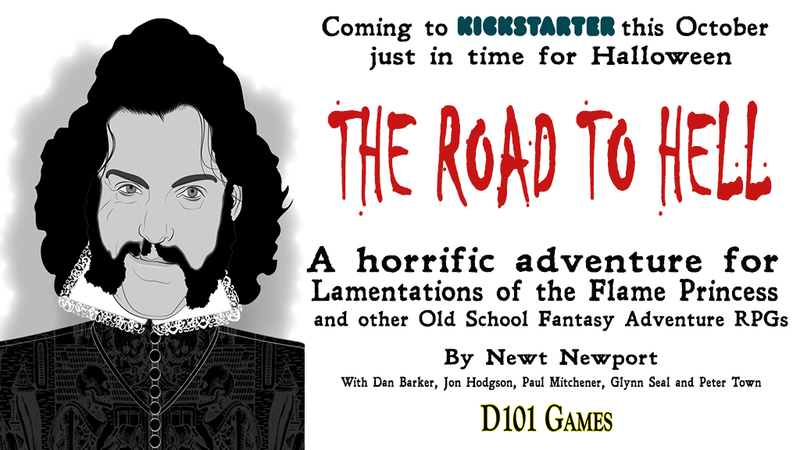 The Road to Hell on Kickstarter until the day before Halloween. The Road to Hell is well on its way to being funded, and while progress is slow (we are at 54% with just over two weeks to go) we will get there by the end of the funding period on the day before Halloween (Oct 30). The team of artists that I’m working on this one have been producing work to act of preview of what we aim to do when the Kickstarter funds. 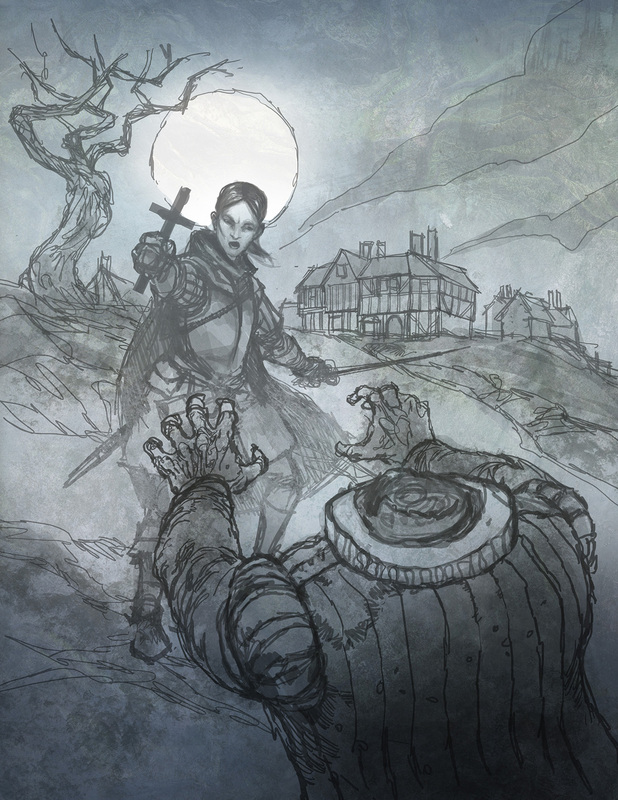 Jon Hodgson has done this chilling sketch of the cover (he’s in the process of completing the full piece at the moment). 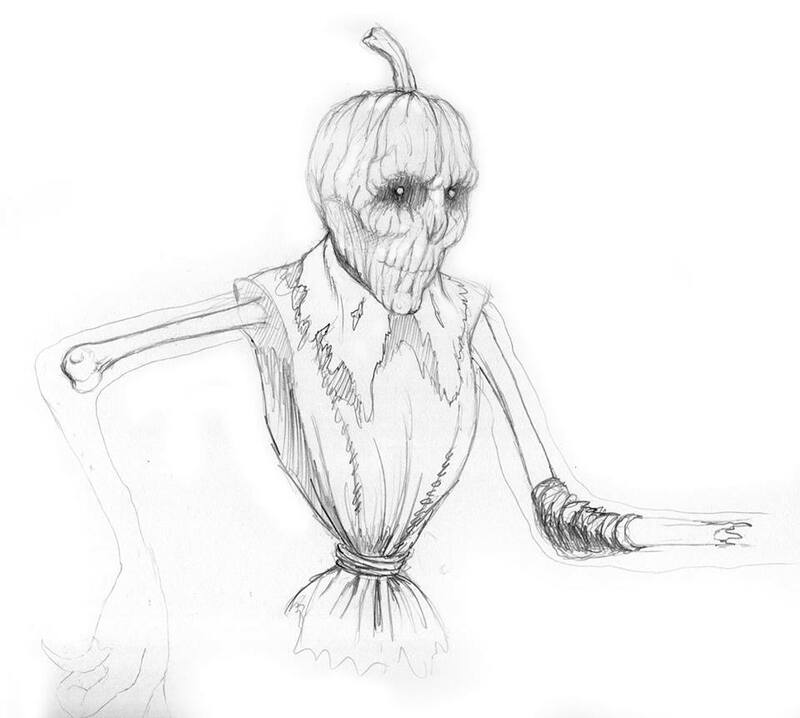 Interior artist Dan Barker has done this sketch of one of the monsters that feature in the adventure. D101 regular Peter Town has been charged with doing portraits for each of the six pre-made characters who are included in the book with the adventure. I’ve also posted a number of updates which give more insight about what’s in the book. 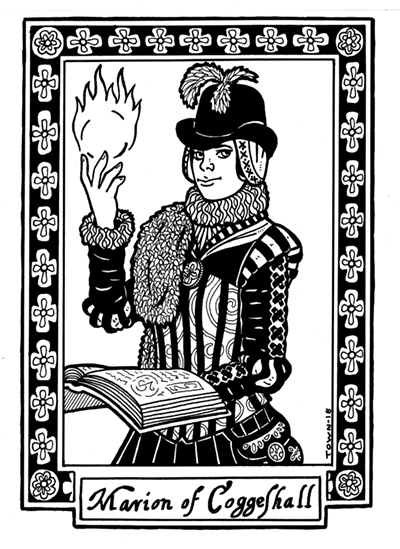 Pre-made Characters – lists the six pre-made pcs and gives Marion of Coggeshall as a full example. Dr Dee’s Letter – this player hand out is given to the characters by their contact in London to give them instruction on how to join Dr Dee’s employ in Manchester. It gives a few hints on what is going to happen in the adventure. 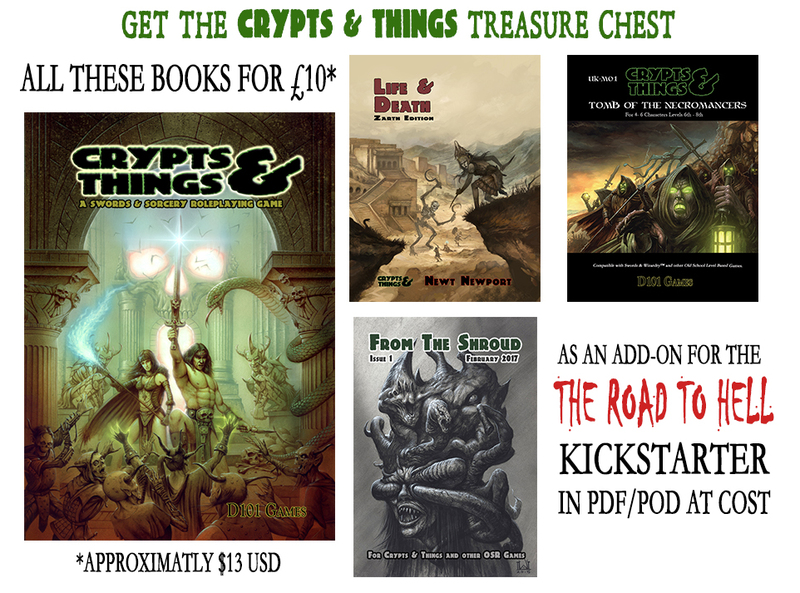 Finally, I’ve added an add-on, which will be of interest if you fancy picking up Crypts and Things and two of its adventures at a bargain price. 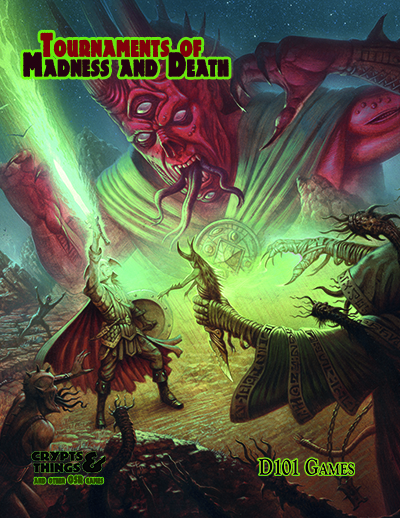 The Road To Hell is an adventure for Lamentations of the Flame Princess and other Old School RPGs. It is now live on Kickstarter until Tuesday 30th October, the day before Halloween, when if it funds all backers can download the draft adventure, complete with rough (but functional) maps and six premade characters. 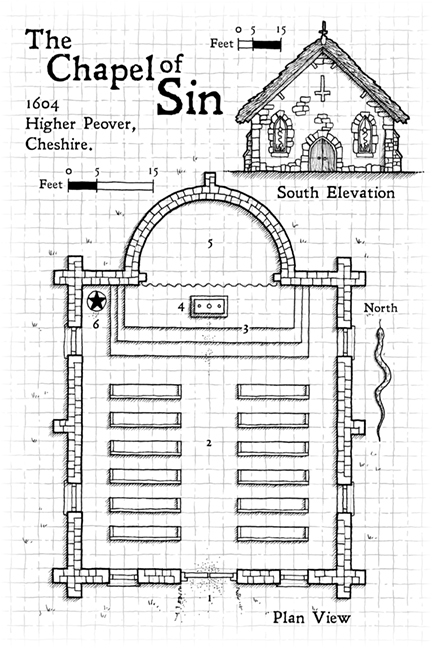 Set in Jacobean England, this adventure sees a band of veteran (5th Level) but down at heel adventurers take a desperate journey between Chester and Manchester in the North West of England, that takes them into Hell itself. It is a weird fantasy adventure that sees the adventurers thrown into magical situations outside of their normal lives, and challenge fiends that would eat their flesh and steal their souls. Dan Barker (Monkey, Tournaments of Madness and Death) on internal art. Paul Mitchener (Age of Arthur, Liminal) on the editorial duties. Glynn Seal (2018 Golden ENnie Award winner for Cartography for his work on the Midderlands).